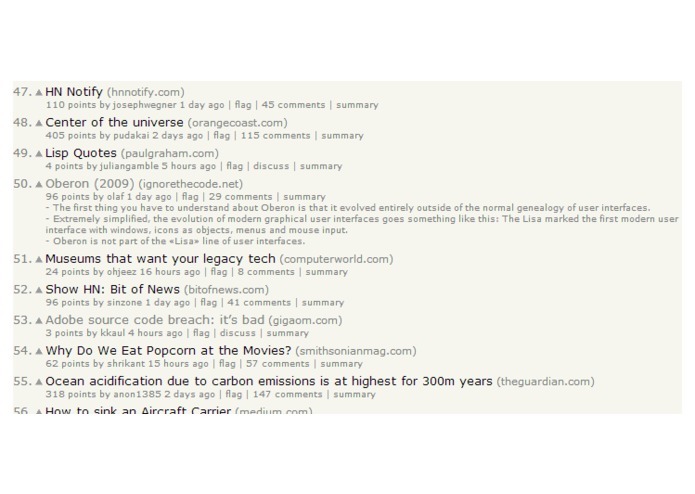 ADHN ("attention-deficient Hacker News") is a simple userscript that adds inline summaries of articles to Hacker News. Clicking the "summary" button added to each news item makes an API call to clipped.me, which summarizes text into three (or fewer) bullet points. There are a few use cases in which these summaries are desirable. A user may be pressed for time but still in need of a news fix; they may have only a passing interest in a topic, and do not wish to read a full article; or (as the name suggests) they may simply lack the attention span to stay focused on a single subject for more than a few seconds. Another problem is that readers of Hacker News (and other similar sites) are often confronted with uninformative or misleading link titles that convey very little information about the content behind the hyperlink. For example, the post showcased in the attached image is simply titled "Oberon." Inserting a concise summary of the article content reveals the true nature of the post and allows the user to make a more informed decision as to whether it is worth reading.